John Beiswenger's lawyer has clarified that his case will progress despite gamers' ire. A few weeks ago John Beiswenger launched a lawsuit against Assassin's Creed developer Ubisoft, alleging that the Animus device featured in the studio's successful sneaky-stabby-jumpy-through-history franchise borrows a little too heavily from a similar machine he dreamt up in his 2003 novel Link. He also alleges that several key themes overlap between the two works in a way which, coupled with the Animus concept, infringes on his copyright. As part of the suit, Beiswenger is claiming $5.25 million in damages and asking that the release of this winter's Assassin's Creed 3 be delayed until his complaint is resolved. 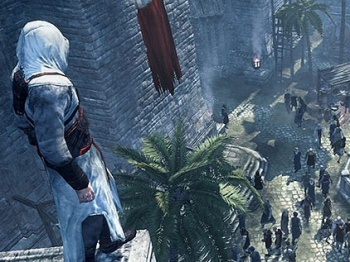 In an interview with Eurogamer, Beiswenger's lawyer, Kelley C. Keller Esq., defended her client's position and responded to the speedy review-bombing that irate Assassin's Creed fans levelled at Link's Amazon page in the days following the announcement of the lawsuit. "We understand that many gamers are upset about the litigation and potential for delay in the release of the next Assassin's Creed video game, and as a result of that anger have been posting negative comments on Amazon - and other forums - about our client and his novel Link," said Keller. "The Amazon 'bombing,' storm of negative comments, and threats to our client have no bearing on the appropriateness, merits, or outcome of this suit. They have no material effect on the legal claims," she continued. One of the first questions to spring to the collective gaming mind when the suit was announced involved wondering why Beiswenger took so long to sue. The first Assassin's Creed was released five years ago, and Link is nearly nine years old; why the wait? "The claim has been brought within the applicable time periods required under the law," said Keller. When asked why the case includes an attempt to stall Assassin's Creed 3, Keller said, "Copyright holders are entitled to injunctive relief under the law to stop continued infringement." Not the type to mince words, lawyers. I have to be honest here: I've never trained in law. (I know. My parents are disappointed, too.) With that in mind, I really have no clue whether or not Beiswenger's case is going anywhere or really possesses the power to hold back Assassin's Creed 3. All I can say is that Keller is an experienced-sounding lawyer with a website, and that the last publicly-available event to occur in the case of Beiswenger vs. Ubisoft was something involving "SPECIAL ADMISSIONS FORM APPROVED" and other legalese. So, that about wraps it up for now. We'll keep our ears to the ground for updates on the lawsuit's progress; in the meantime, if any intellectual property lawyers in the audience know of any compelling legal information that could shed light on likely progression routes for the case, please do drop us a line. Or concentrate on your probably very important lawyer-business. As you please.